Pan Seared Tofu, which involved slabs of tofu topped with peppercorn in a miso broth over mashed potatoes and bok choy. My omnivorous friend remarked that it reminded him of roasted turkey and mashed potatoes. The savory flavors that the miso gave it was out of this world. I can honestly say this is the best tofu dish I’ve had in my 12+ years of being vegan. We learned that the mashed potatoes are made with earth balance & coconut milk. Pad Thai (vegan if they omit the fish sauce & egg). 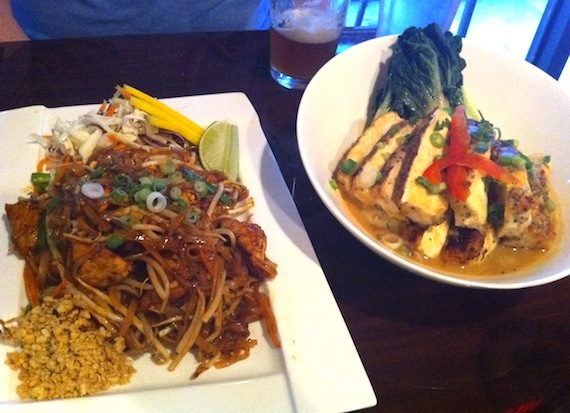 Its been a while since I had Pad Thai; I was given a choice of tofu or seitan as the topping. I went with tofu and it did not disappoint. 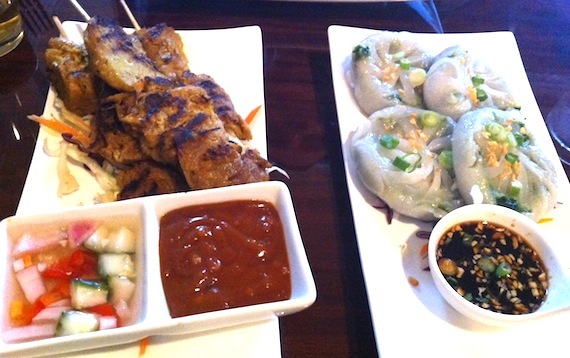 If you don’t mind some spice, the correct answer to “do you want it hot or do you want it Thai Hot” is “Thai Hot”. We paired our food with some beer we brought: Jolly Pumpkin ES Bam (hoppy, bretty farmhouse ale) & Kona Wailua (passionfruit infused wheat beer). Of course, this was all too much food to finish in one sitting, so we waddled away after our meal with takeout boxes in hand. A word to out of towners: the area where Circles is at is bordering on sketchy-ville. It is easy to get to via subway, but I don’t recommend going (walking) much farther west. But I can recommend the South Philadelphia Tap Room, 3 blocks directly south (get the vegan hoagie: tempeh, sauteed mushrooms & vegan mayo! ), or the plethora of vegan friendly establishments a few blocks east on Passyunk Ave.
Looks good, and reasonably priced, thanks for the review. This has been on my to-do list since a few weeks ago and was hoping someone would report back with photos and more details. I was going to order delivery but now I actually want to go, as I bet that tofu/mashed potatoes entree is the kind of thing that tastes like heaven right away and might not travel well…nice to see that the seitan was worthwhile, too! Is so hard to find really great seitan as a lot of chefs can’t nail it right away. Today a girl was handing out menus for Circles on 4th Street, just another sign that I need to go. Thanks for the review! I’m going to Philly next month for a wedding and will definitely go here. Where else is good? Please leave comments. Happycow has steered me wrong. Horizons of course is one of the best gourmet vegan places in the world. You can’t go wrong there – but they are closed on Sundays and Mondays. I tend to go to a lot of bars – there are a ton here that are very vegan friendly. Memphis Taproom, Royal Tavern, Khyber Pass, Cantina Los Caballitos, Local 44, Belgian Cafe are probably my favorite, food-wise. Kelly from livingonthevedge.net (commentor above) has an awesome blog where she reviews a lot of philly restaurants too – there are probably some good recommendations there as well. Anything in particular you like restaurant-wise? I went to school close to Philly and would go into the city to visit a friend. We’d always go to Singapore in Chinatown. I absolutely adore them – their sesame chicken and mu shu are very yummy. I’d also make a pilgrimage to Vegan Treats in Bethlehem or at least find a place in Philly that has their desserts – so good! Oh duh – forgot to mention Blackbird Pizza – their seitan cheesesteak & the cubano sandwhich are pretty amazing. Definitely a must visit. Singapore is great but I think I like New Harmony better (also in chinatown.) Love the Phoenix chicken, which we refer to as meat-stuffed-meat (fried “chicken” stuffed with “ham”) and the (steamed) buddhist style rolls. kmudrick is THE east coast vegan (and beer) guide!!! Definitely the seitan cheesesteak at Blackbird. Koo Zee Doo is a Portuguese BYO that is widely respected, they have two veg entrees that can be prepared vegan and my favorite salad in the city right now. Sweet Freedom Bakery cookie sandwiches are one of the best vegan desserts in the city. For brunch, I like the tofu scramble and breakfast quinoa at Green Eggs Cafe (two locations). The quinoa can be prepared with soy. Most of the bars and coffee shops in Philly are way more vegan friendly than the fine dining restaurants – vegan wings and sandwiches are everywhere…but if you want to check out the Garces, Vetri, or Starr restaurants, just call ahead, I’ve eaten at all of them and had some really great experiences. who knew Philly was so vegan-friendly?? wow. Also listed are many Philly based food blogs. Agreed – Taylor’s blog is great & she’s really nice in person too.